Do you know what's good for this weather? Korean BBQ. Oh no, wait, scratch that, Korean BBQ is good for all kind of weather. 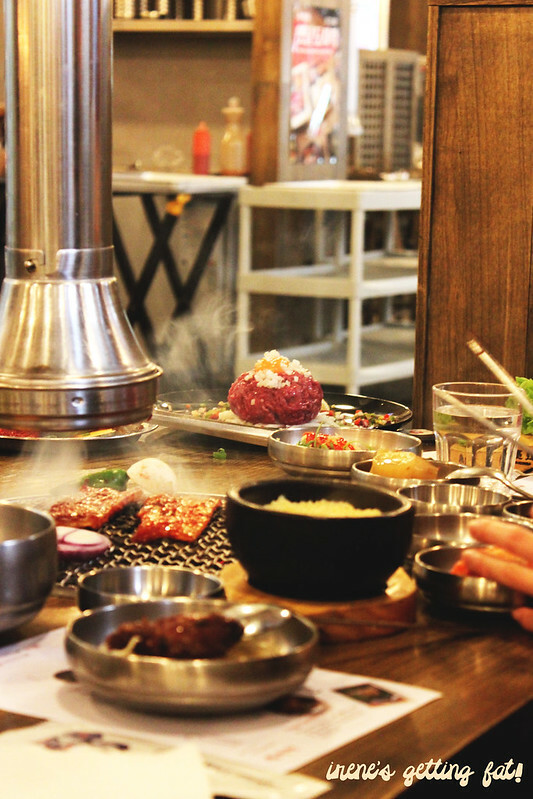 678 Korean BBQ is one among the million options in Sydney, and often said to be one of the better, if not the bests. 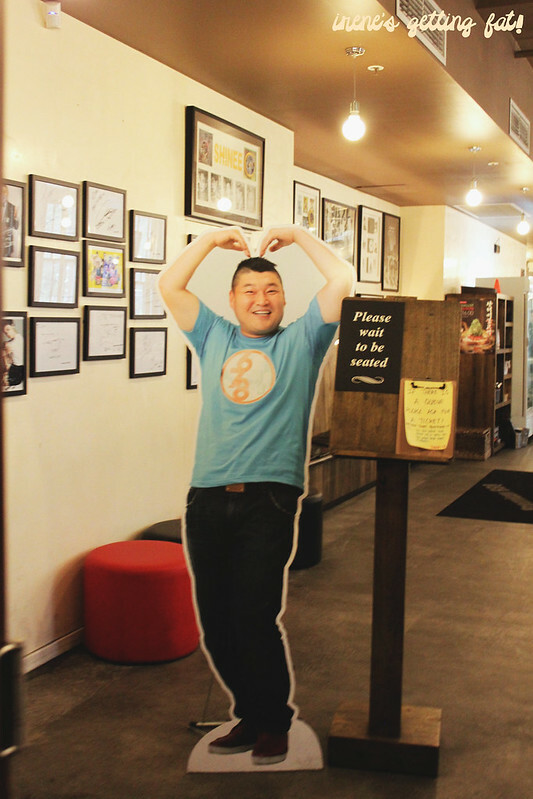 It is owned by Kang Ho Dong, whose cut-out figurine will welcome you at the entry, a South Korean comedian and ex-wrestler. 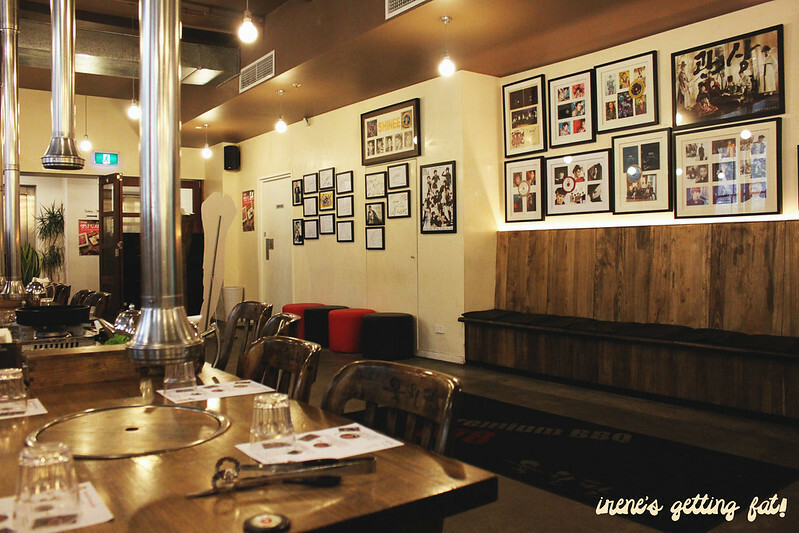 The venue is capacious, dominated with wooden and warm colours, giving you a pleasant and comforting vibe in an instant. What caught my eyes quickly was the wall full of photographs and autographs of famous Korean actors/actresses, musicians, and celebrities. 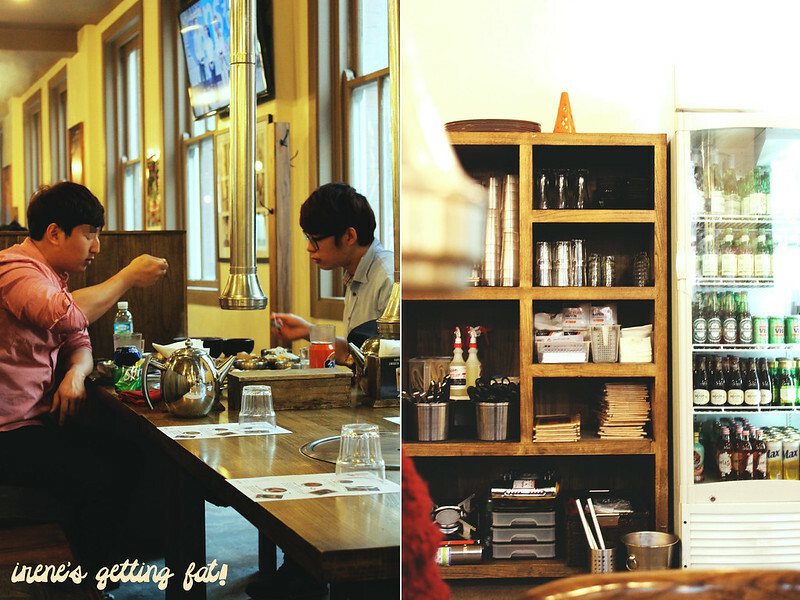 And apparently Running Man casts went here when they came to Sydney a few months ago. I will sound really biased here, but if it's good enough for them hilarious members, it's good enough for me. I have been here two times. The first time was with the Koreans celebrating the end of semester, and none of them shared the same idea of mine to get the charcoal BBQ. Losing votes, I had to go with their favourites. And I didn't regret one single thing. The boys went straight to soju (Korean vodka; about $10 a bottle) ordering, but I was more interested in the banchan (side dishes) spread. From addictive fried little fish (ikan bilis/teri?) to the obligatory kimchi; all was there. They even gave dried seaweed sheets (nori) which is perfect with rice and a light dip into the soy sauce. 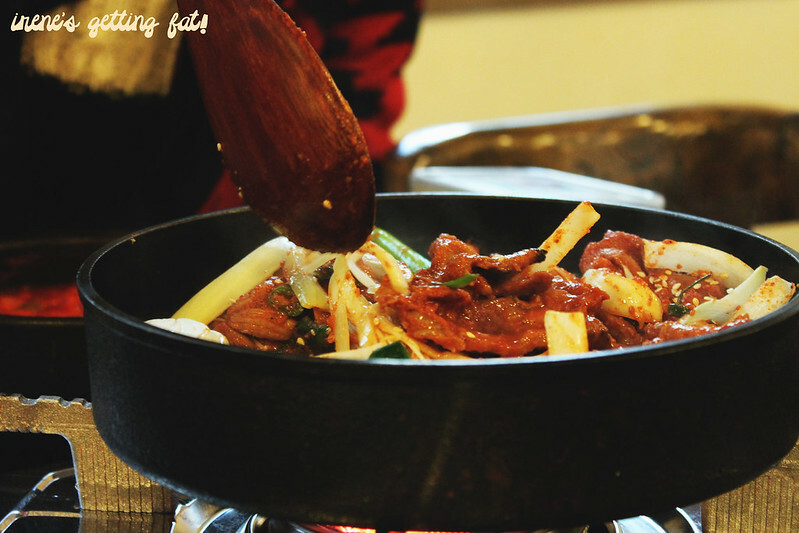 Two portable mini stoves were brought out to our table; one was for the bright-red spicy chilli pork (dwaeji bulgogi/돼지불고기). It was meant to be mixed together with the veggies and mushrooms atop, but be careful not to overcook the meat as it is cooked already. We were lucky to have someone with a culinary background (not me) among us, every slice turned out juicy and tender. The flavours were bursting too, although it didn't have strong jabs of chilli like I expected. 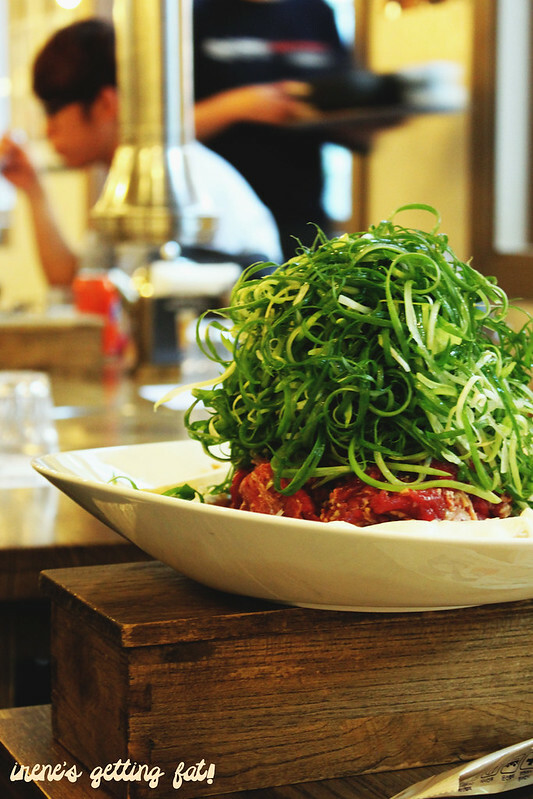 Under the colossal mountain of shredded shallots, there were some slices of soy marinated beef scotch fillet somewhere. 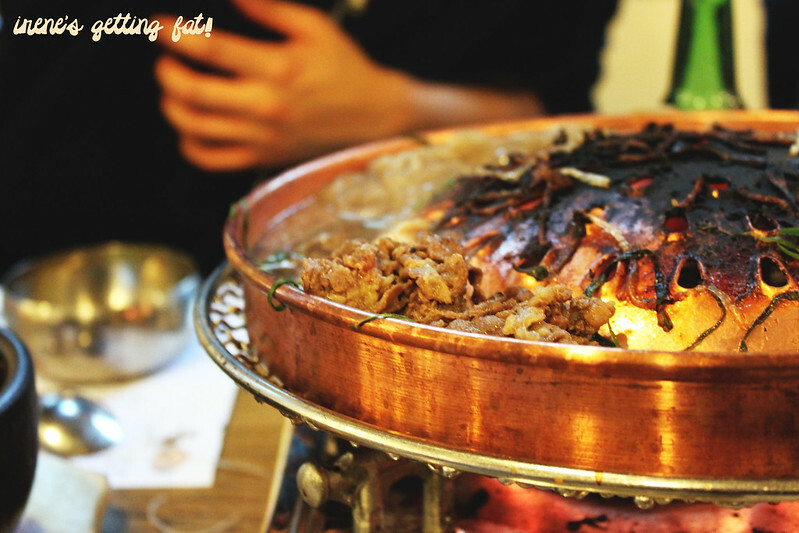 It was the shallot bulgogi, came with another mini stove and a grill-slash-pot filled with sweet, warm broth. On the plate were also mushrooms and sweet potato noodles, and we put them all into the pot. 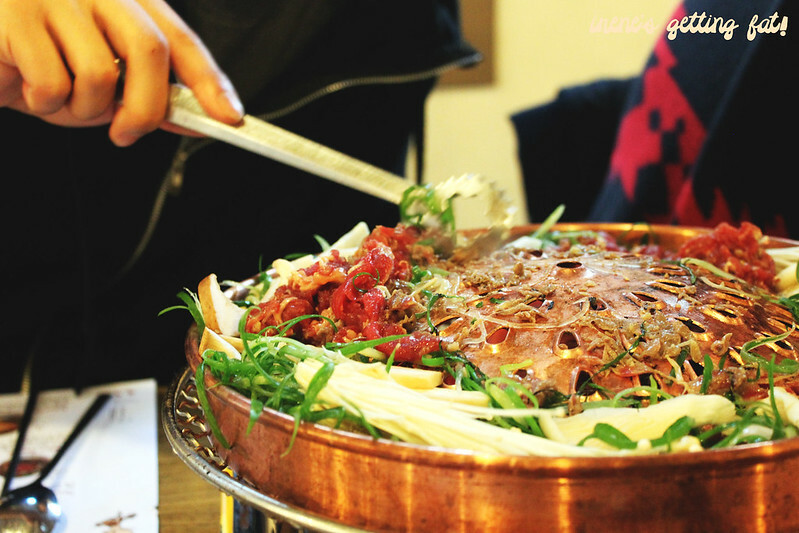 The result was more than belly-warming, it touched our souls with great depth of sweet and savoury notes from the broth, tender beef slices, and slippery mushrooms and sweet potato noodles. A superb dish to have while watching strong winds swaying the branches from the window. Two days later, still with the same chilly winds, a friend and I went back for the charcoal BBQ. 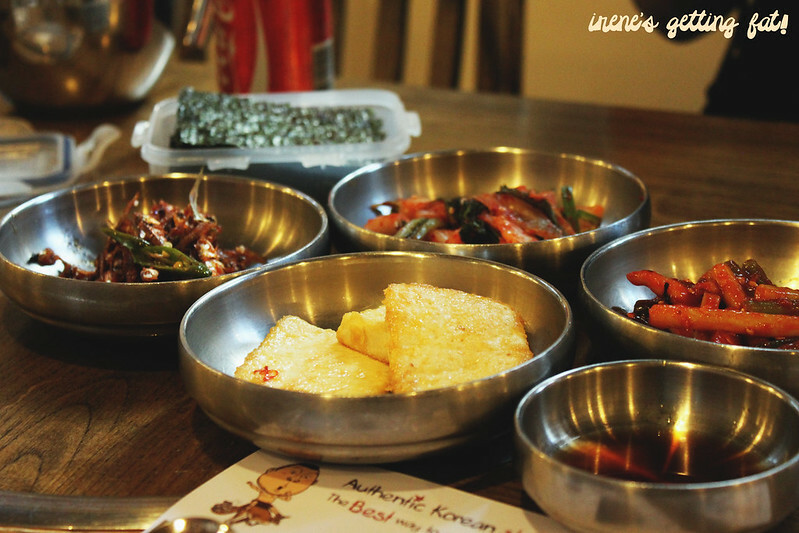 This time, the banchan dishes were different, with some additions of pickled radish with gochujang sauce, sweet steamed potato, soy sauce with chilli, chilli-soy bean paste, and a small bowl of steamed egg. The latest was a surprise, at first I thought they gave the wrong dish to the wrong table. Turned out it was included in the BBQ set. It didn't have much flavour but sure was smooth and definitely warmed out throats.Plus, I love everything with eggs. And don't forget the leaves. From perilla to lettuce, even raw green chillies and capsicum; they covered it. We didn't tried many meat dishes but we made sure a plate of pork belly went to our table. Apparently it was different cut from the thin slices of pork belly I usually encounter (samgyeopsal/삼겹살), as this one had more fat and was called ogyeopsal (오겹살). The two slices were thick and it took a while to cook it through. Although it was tender with melting ribbons of fat, I still prefer the thinner version. The boneless marinated beef short rib (yangnyeomso kalbisal/양념 소 갈비살) was faultless. We cooked it until it had pink centre and every cut tasted divine. Especially wrapped together in perilla leave with some rice, kimchi, pickled radish, onion, chilli paste, and grilled green chilli. We only ordered two meat dishes but man it was full-on. Note the presence of onion in sweet soy-sauce-like sauce which I couldn't have enough of and clear cold soup. 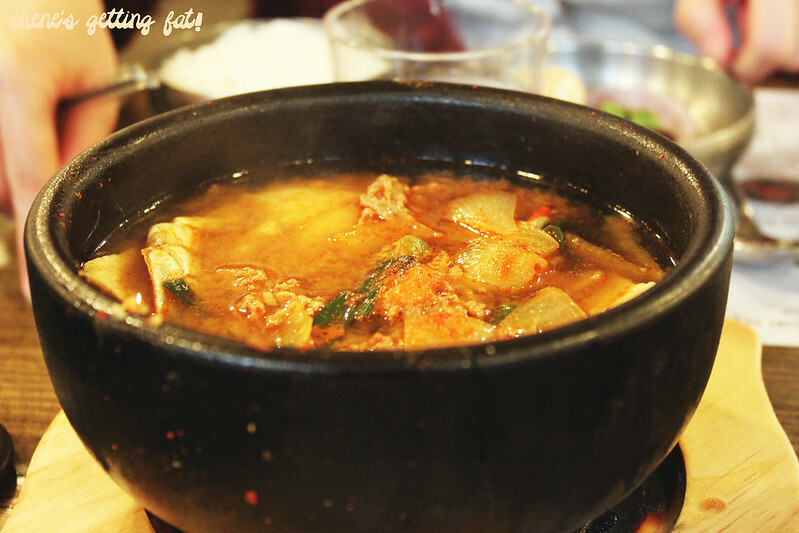 Their soy bean paste soup (doenjang jjigae/된장 찌개) was not earth-stopping but it had the all flavours it needed. On both occasions, it arrived piping hot and if you dig into the stone bowl you will find a half of crab with its sweet meat intact. I had fun slurping it out. 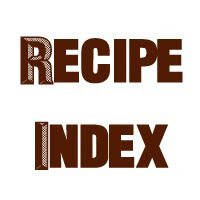 I am planning to try the other meat dishes next time. 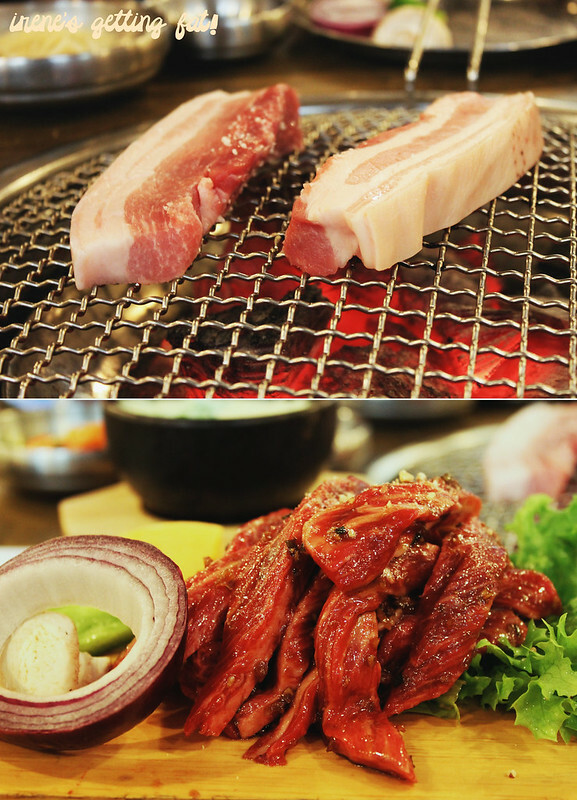 With these freezing days, I foresee many Korean BBQ cravings in the near future. 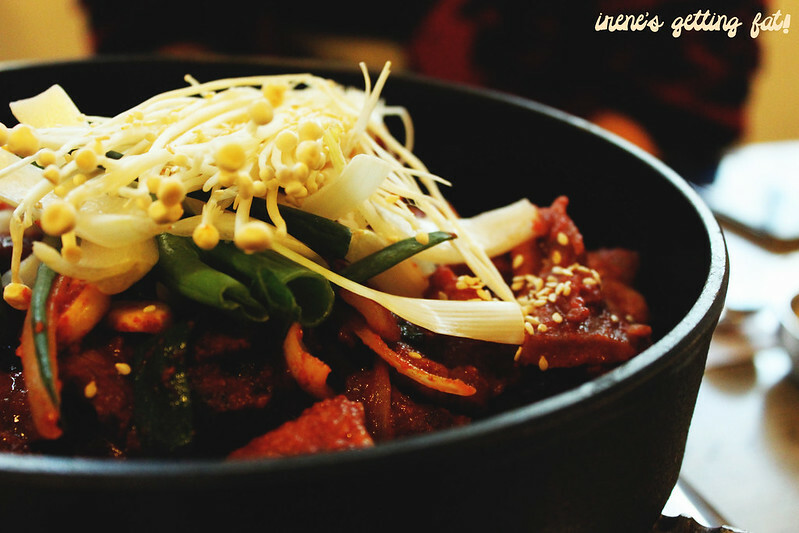 If you have your own favourite Korean BBQ places, throw them out to me! Would love to try the recommended ones. Cheers! 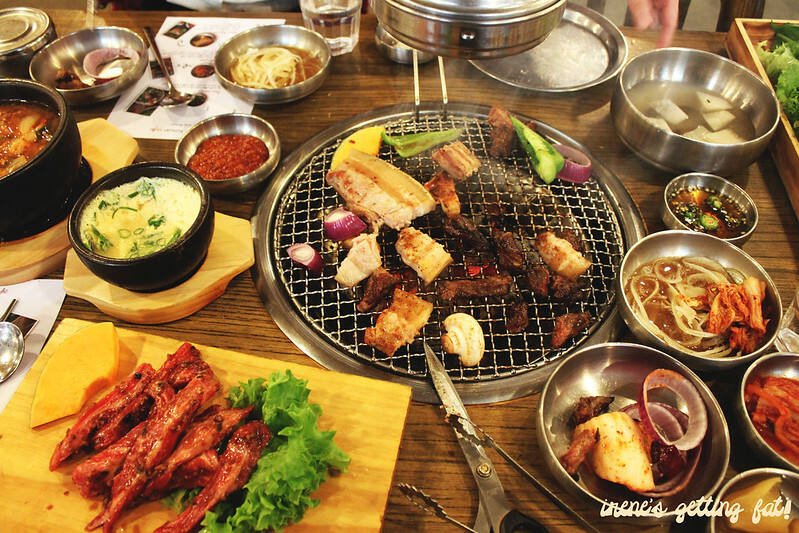 Great dishes with reasonable prices, charcoal BBQ is satisfying, especially with the countless banchan, service may not be too attentive but is quick, ambiance is nice and comfy. lolol love the cutout of the owner! And yum, Korean bbq is the best! I know right, how creative is that? And yes, totally agreed! The cutout is hilarious :) I can't believe I haven't been to that Korean BBQ place yet!! My favourite banchans are the korean pancakes, the potato salad and the fishcakes! Do they have some of these? Also the price of that wagyu is fairly reasonable!! Must GO! The banchan here is awesome, I've never been given the crispy little fish before anywhere else. And about the ogyupsal.. Not really. But maybe we cut it too thick. 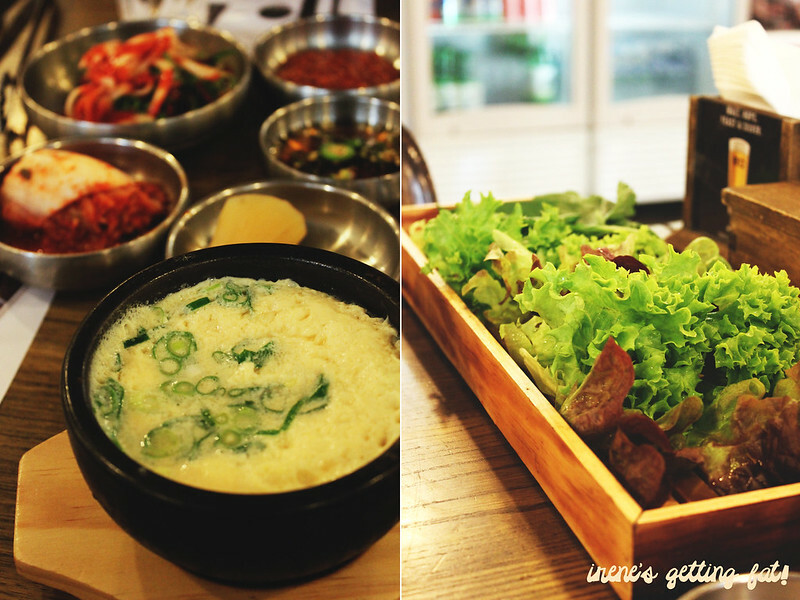 mmm~ need to head back here!! Koreans and their mountains of shallots! haha! They have a thing with shallots! hahah. great colourful photos Irene! i am craving kbbq now!